Size is usable inside size. Printed on one side, clear on the other. Genuine Apple Brand Ziplock bag, thicker and stronger than the 2 mil bags many other sellers offer. The half dollar is only to show the size. Designs included may vary, and some in the photo may no longer be available, but always 10 different designs, 100 of each design. 200 Heavy D Baggies 2020 Apple® Brand Bags 2 x 2 in. 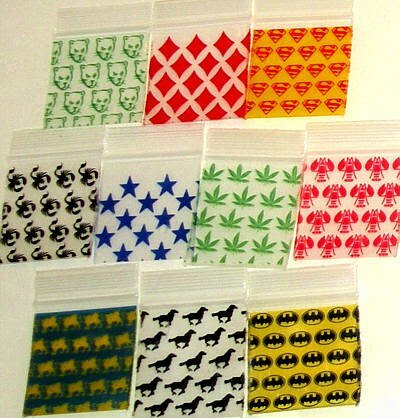 200 Red Diamonds Baggies Small Ziplock Bags 0.5 x 0.5"